Lenovo-owned smartphone-maker Motorola on Tuesday announced the launch of Moto Z and Moto Z Play priced at Rs 39,999 and Rs 24,999 respectively. The new modular smartphones will connect 'Moto Mods' magnetically to the device to deliver advance functionality functions such as better audio, camera etc. The phones will be available exclusively on Amazon.in and Flipkart starting 11:59 pm, 17th October. The company first unveiled the Moto Z series at the Lenovo Tech World 2016 in June in San Francisco. The company has announced various modules including JBL sound boost speaker, Hasselblad true zoom camera, Instashare projector, Incipio offGRID Power Pack etc. These modules are priced starting at Rs 4,999. 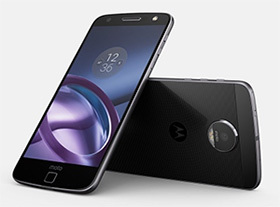 The Moto Z smartphone features a 5.5-inch Quad HD AMOLED display and is powered by Qualcomm Snapdragon 820 processor. The phone features a 4GB RAM and is loaded with a 2600-mAH battery which the company says gives 24 hours of battery life. The Moto Z smartphone comes with a 13MP, f1.8 camera with optical image stabilisation and laser autofocus rear camera and front-facing 5MP camera. The phone supports turbo charging and the company says users can get seven hours of power in 15 mins. It comes with 64 GB of internal storage option and supports external space up to 2TB via a microSD card. The Moto Z Play smartphone comes with a 5.5-inch screen with 1080p Full HD Super AMOLED display. The phone is powered by 2.0 GHz octa-core processor and 3GB of RAM. The company says the Moto Z Play comes with Moto's longest lasting smartphone battery ever. The device which comes with a 3510-mAH battery also supports turbo charging and the company says gives up to 45 hours of battery life. On the imaging front, the Moto Z Play comes with 16 MP rear camera and 5 MP front camera. Both these phones come with USB-C port which means you no longer need a 3.5-mm audio jack for audio connectivity. What sets these two devices apart from the crowd is the modularity of these devices. It would be interesting to see how these devices are received in the Indian market.